The Tour de France has started ! And what a great place for it to start ! Of all the places where it could start, nothing could match the wonderful scenes in London. It's not always guaranteed that when the Tour starts outside of France that it would be in the best place that country has to offer. The team presentation at Trafalgar Square, under Nelson's column, with concert by R'n'B singer, Lemar. A prologue that went through all the famous sites - Whitehall, Houses of Parliament, Westminster, Buckingham Palace, Hyde Park, the Mall. Stage 1 filing out of London passing the London Eye, St Paul's Cathedral, Tower Bridge and then finishing at Canterbury Cathedral. A bike course fit for Kings - shame they couldn't stop and take photos ! As a spectator it was pretty surreal - being able to walk around these places that are normally heaving with traffic. From Friday to Sunday major thoroughfares like Whitehall, the Mall, Park Lane were ruled by pedestrians and cyclists. We spent Saturday afternoon watching the prologue - all 189 of them at various points of the course - along Victoria Street, Buckingham Palace, and Constitution Hill. I made this point my final viewpoint as I got to see the riders travelling in both directions, and it was also to the 1km to go mark. Being opposite Green Park, where there was a big TV screen meant there was commentary as well. 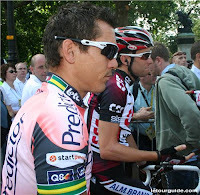 Stanley moved on further to watch the riders at Hyde Park corner, where they were greeted by enormous crowds in Hyde Park. The sight of French Gendarmes on their French registered motorbikes and in French police cars in the middle of London ! 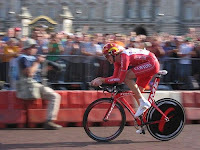 The sheer speed of the riders as they passed - especially Fabian Cancellera - in excess of 55km per hour. The sound of some of the director sportives shouting at their riders over a tannoy as they followed them in the team car - Venga Venga ! Andiamo ! Allez Allez ! The party atmosphere among the 2 million spectators that thronged the streets. 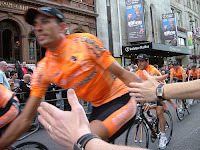 The ear shattering roar from the spectators as certain riders came past - notably Bradley Wiggins, Geraint Thomas, Mark Cavendish, David Millar Fabian Cancellera, Andreas Kloden and Alexandre Vinoukourov. The warm sunshine that was especially arranged for the day. I didn't go to watch Sunday's proceedings as I had to prepare for the road racing I was doing that afternoon. From what I saw from the TV though, it looked like there was just as much enthusiasm along the roads through Kent. More than a million lining the streets. And they say England isn't a biking nation !! I hope the riders had as great a time during the event as we had watching it. Whatever you think of Ken Livingstone, you've gotta hand it to him on this one. I can't imagine any other Mayor of London laying on such a fiesta ! Thanks alot Ken !